Underground cybercriminal flora and marketplaces have a lot to hide – from recent trends to upcoming prospects, from leaked vulnerabilities to the newest financial malware samples. Sergey Lozhkin, security researcher at Kaspersky Lab, will show you what can be found there. Join the talk and learn what can be done with the help of proper underground threat intelligence – and how it could help your business before any attack takes place. Mobile malware has become one of the fastest growing segments of the global cybersecurity threat landscape, with dynamic changes and significant developments happening all the time. Victor Chebyshev, security researcher at Kaspersky Lab, has researched this topic extensively and is author of its Mobile Malware Evolution 2018 report. During the past year, Victor has been observing trends, processes and the entire phenomenon that is the mobile malware market. In this webinar, Victor will recap the most significant trends found in the mobile malware industry in 2018. He will also identify which trends are gaining popularity and which are dying, along with why. Victor will also explore the overall picture of the mobile threats landscape, explaining how cybercriminals are performing large-scale cyberattacks on users and share his predictions for what mobile threat actors could have planned in 2019. Nearly 1.5 million dollars. That’s how much an average data breach in the cloud costs enterprises, according to the Global IT Security Risks Survey 2018. 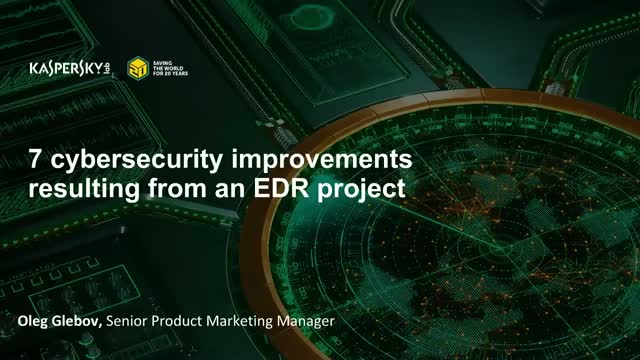 During the webinar, Maxim Frolov, VP Global Sales, Kaspersky Lab, presents key findings from the company’s latest report On the Money: Growing IT Security Budgets to Protect Digital Transformation Initiatives. Maxim, along with special guest Jim Reavis, Co-founder and CEO, Cloud Security Alliance, will discuss the potential damage and the main risks associated with cloud breaches, as well as what businesses can do to protect themselves. Webinar attendees gets the latest insights on the dynamics of corporate security incidents and IT security budgets. They will learn what financial, organizational and technological decisions should be made to protect businesses from the threat of cloud infrastructure breaches. The connected world needs a strong, resilient cyberspace, but the landscape is increasingly fragile and fragmented. At this summit, hosted by Kaspersky Lab, leaders from across the cybersecurity industry will debate the growing need for transparency, collaboration and trust in addressing these challenges and more. Containers are rapidly gaining in popularity, with more and more companies using them for production. But this situation also attracts cyberattackers. Join our webinar to find out more about the key security issues arising from using containers in production, and how their resolution can fit into your entire hybrid cloud protection strategy. Replay: Kaspersky Lab is hosting a digital panel, bringing together cybersecurity executives and experts, to discuss the challenges that Chief Information Security Officers are facing after 86% revealed they believe cyber breaches are inevitable in a global survey. More than a third of CISOs say they struggle to secure required budgets when they cannot guarantee security, but how can they persuade the board to offer them more resources? This summit will cover how CISOs can manage limited resources – such as internal talent and budgets – to effectively protect increasingly digital businesses, as well as the importance of collaborating with other departments and company boards to keep up with the ever-evolving cyberthreat landscape. The panelists include Christian Toon, Chief Information Security Officer, Pinsent Masons LLP, Ilijana Vavan, Managing Director, Kaspersky Lab Europe, Thom Langford, Chief Information Security Officer, Publicis Groupe. The event is moderated by Tilly Travers, Senior Corporate Communications Manager, Kaspersky Lab. As part of the World Cyber Security Congress in London on March 27, Kaspersky Lab was conducting a seminar exploring ways to solve the problem of protection in the digital world, where the risks are so high, and where the only sure defense lies a comprehensive security approach.